Do you ever have those moments when you think to yourself, “Damn. I’m impressed with myself”? Well, this was one of those moments for me. I’ve never made bread from scratch before. Well, besides banana bread or things similar to that. (Do those even count?) But, I’m talking from scratch, yeast sandwich bread. This baby has to rise TWICE. That’s dedication. 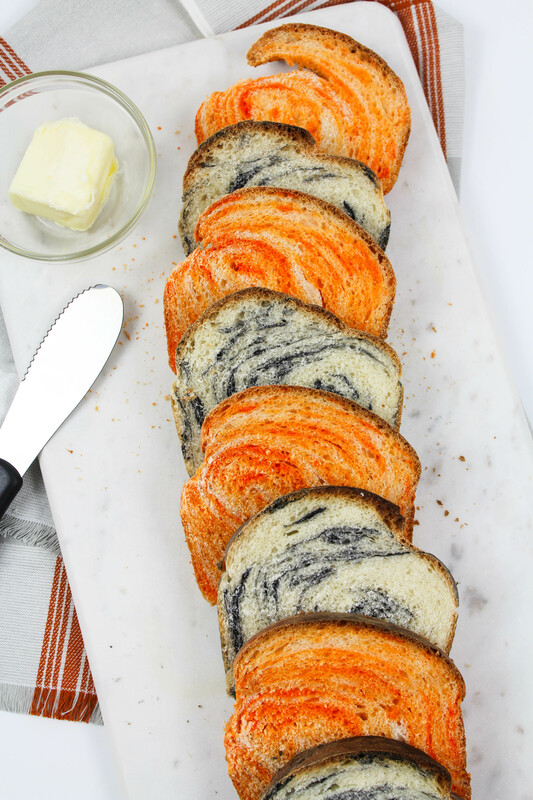 Add in the fact that I even took it up a notch and made marbled bread for halloween. Because, Halloween definitely needs it’s own loaf. Am I right? I was not only impressed with myself, but I was also surprised that it was soooo easy to make. Why have I not done this before?! Don’t let the thought of making homemade bread intimidate you, like I obviously did prior to these little beauties. I’ll be making a lot more fresh bread in this house from now on!